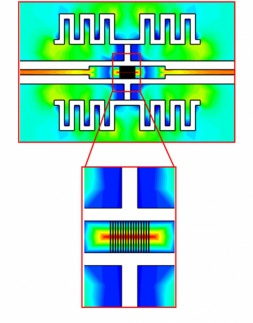 Researchers have discovered a way to create electromagnetic Terahertz (THz) waves or T-rays, which are used in the large full-body scanners seen in airports, in a very small package. Small enough to have Star Trek fans thinking of tricorders. 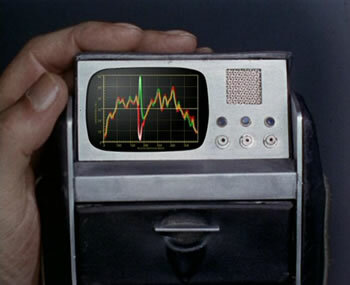 The scientists say that the T-ray scanner and detector could provide part of the functionality of a Star Trek-like medical 'tricorder' - a portable sensing, computing and data communications device - since the waves are capable of detecting biological phenomena such as increased blood flow around tumorous growths. Future scanners could also perform fast wireless data communication to transfer a high volume of information on the measurements it makes. The structure of the tip-to-tip nano-sized gap electrode greatly enhances the THz field and acts like a nano-antenna to amplify the wave generated. From Imperial College News via Extreme Tech. Thanks to Winchell Chung (aka @nyrath) and also Adi for the tip on this story.